Do you have a cute kid!?! 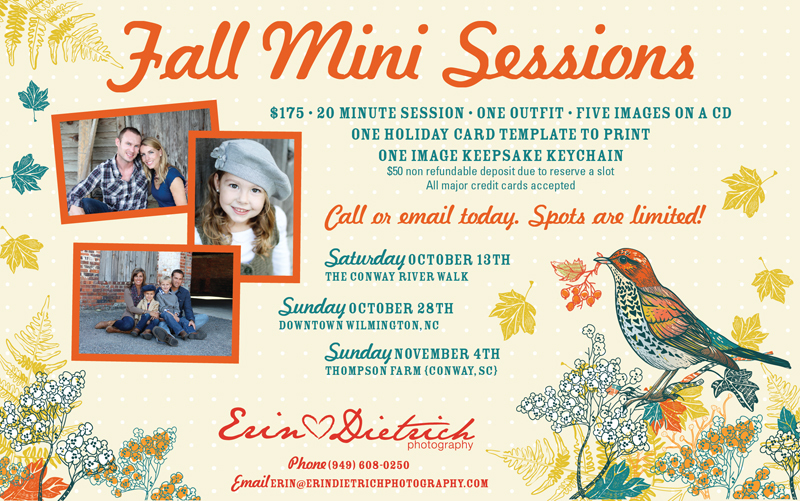 Do you want to win a FREE spot in the Erin Dietrich Photography Fall Mini sessions? We have three mini session dates scheduled for this year. Each at a different location! Two located in Myrtle Beach, SC area & one in Wilmington, NC. -A FREE spot in our fall mini sessions. -The winner will also get to pick which one of the already scheduled fall mini session date/location they want! Over $200 value! Absolutely no purchase required! Child must be between 3 months-8 years old. Only parents or legal guardians of the child may enter. Entries must be received via email by midnight on Thursday, September 20th 2012. To enter you MUST be a fan of Erin Dietrich Photography on facebook. Entry photos can be a snapshot photo or a professional photo! It will be up to your friends, family and our facebook fans to pick the winner! Images watermarked by other photographers will not be accepted or posted. FREE Fall Mini session can be used for one child, siblings, or immediate families of five or smaller. All entries must be received by email to erin@erindietrichphotography.com by Thursday, September 20th 2012 at midnight. Please be sure to include your child’s name and age in the email with their photograph. Entry photographs with child’s first name and age will be displayed on Erin Dietrich Photography fan page during the contest. This can not be used for a mini session that has already been booked. This is meant to be FUN! No negative comments of any kind will be acceptable. This will cause the comment to be deleted, the user to be blocked and the vote will not count. Voting will take place from Friday, September 21st-Wednesday September 26th ending at midnight on the 26th. Voting will take place on the Erin Dietrich Photography Facebook Page through fan “likes” on each photo. An album will be created on the Erin Dietrich Photography Facebook fan page that includes all the entry photos. Friends, Family and Fans can simply vote by “LIKING” the child’s photo. The photo with the most “LIKES” at the end of the contest will be the lucky winner! VOTERS MUST FIRST “LIKE” THE ERIN DIETRICH PHOTOGRAPHY FAN PAGE BEFORE VOTING! Only one vote per Facebook user. Share the contest through your own Facebook page to encourage all your own Facebook friends know to go vote for your child! Winner will be announced on Friday September 28th, 2012. This promotion is in NO WAY sponsored, endorsed or administered by, or associated with Facebook. By entering the contest, you are providing information to ERIN DIETRICH PHOTOGRAPHY and NOT to Facebook. Prizes do not have cash value. There will be no substitutions of any kind.